SYMHEALTH 2019, 19th, 20th April 2019. 1200 delegates from all verticals of healthcare such as doctors, medico legal experts, insurance & IT professionals, NGOs, hospital administrators & clinical research professionals from all over India and abroad. 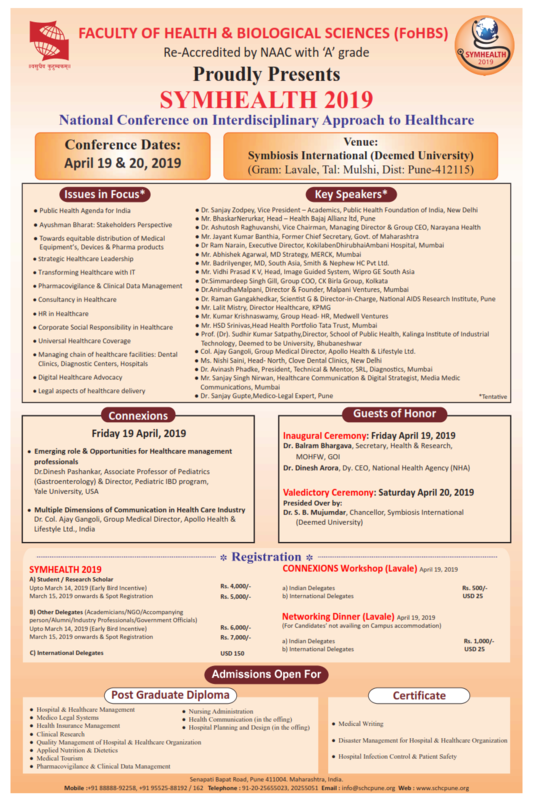 SYMHEALTH 2019 is a two days’ event organised by the Faculty of Health and Biological Sciences (FoHBS), Symbiosis International (Deemed University), SIU which is being hosted at the university campus, Lavale, Pune on 19th & 20th April, 2019. It is an event that marks the significance of integrating ideas and information from across many disciplines. This is in consonance with our mission of contributing towards knowledge generation & dissemination. The conference provides a platform through which various stakeholder groups can discuss and proffer practical and workable solutions to the challenges of healthcare. The Conference will provide an opportunity for stakeholders beyond academia and industry, to exchange insights, present emerging opportunities, make networking connections, and to share resources. The two thought-provoking days of the conference results in deciphering knowledge both in the sessions and during the many planned opportunities to build rapport and alliances, share advice, stories, case reports and socialize throughout the conference. The highlight of this year’s conference is the incorporation of ‘Connexions’ - a unique event on the first day of the conference. Connexions presents an opportunity for students to attend grooming and skills transfer sessions which prepares them to face interviews. A placement assistance drive is conducted after Connexions which facilitates interested enrolled candidates to interact and get interviewed with prospective recruiters and employers in healthcare sector. Dr. Balram Bhargava, Secretary, Department of Health Research, (Ministry of Health & Family Welfare) has kindly consented to be the Guest of Honor on 19th April, 2019. Dr. Sanjay Zodpey, Vice President Academics, Public Health Foundation of India, New Delhi will enlighten upon the Public Health Agenda for India wherein the Indian government has adopted the National Health Policy to “attain the highest possible level of health and well-being for all at all ages through a preventive and promotive health care orientation in all developmental policies, and universal access to good quality health care services without anyone having to face financial hardship as a consequence”. Panel discussion will be conducted on the perspective of varied stakeholders like Insurance companies, Hospitals & Govt. of Maharashtra on “Ayushyaman Bharat”. The chairperson for this panel discussion will be Mr. Dinesh Arora, Dy. CEO National Health Agency, (NHA), representative of Insurance companies will be Mr. Bhaskar Nerurkar, Head, Health Bajaj Allianz ltd, Pune, representative of hospital will be Dr. Ashutosh Raghuvanshi, Vice Chairman, Managing Director & Group CEO, Narayana Health & spokesperson from Govt. of Maharashtra will be Mr. Jayant Kumar Banthia, Former Chief Secretary, Govt. of Maharashtra. Dr. Simmardeep Singh Gill, Group COO CK Birla Group, Kolkata will shed the light upon the importance of leadership skills for healthcare professionals. He will explain how individual development, including communication skills, coaching, mentoring, negotiation, and motivation theory, works within a leadership role. Mr. Sanjay Singh Nirwan, Healthcare Communication & Digital Strategist, Media. Medic Communications, Mumbai will speak on the Digital Healthcare Advocacy. Digital technology has greatly contributed to improvements in patient care and monitoring, as well as patient communication with primary caregivers, general practitioners and specialists. The digital world has revolutionized the accessibility of health information for people across the globe. Patients no longer must wait for doctors’ appointments to begin their diagnosis process. Some of the other eminent national speakers include - Mr. Abhishek Agarwal, MD Strategy, MERCK, Mumbai. Mr. Badri Iyenger, MD, South Asia, Smith & Nephew HC Pvt ltd. Mr. Vidhi Prasad K V, Head, Image Guided System, Wipro GE South Asia. Dr. Anirudha Malpani, Director & Founder, Malpani Ventures, Mumbai. Dr. Raman Gangakhedkar, Scientist G & Director-in-Charge, National AIDS Research Institute, Pune. Mr. Lalit Mistry, Director Healthcare, KPMG. Mr. Kumar Krishnaswamy, Group Head- HR, Medwell Ventures. Dr. Col. Ajay Gangoli, Group Medical Director, Apollo Health & Lifestyle Ltd. Mr. HSD Srinivas, Head Health Portfolio Tata Trust, Mumbai. Prof. (Dr). Sudhir Kumar Satpathy, Director, School of Public Health, Kalinga Institute of Industrial Technology Deemed to be University, Bhubaneshwar. Ms. Nishi Saini, Head- North, Clove Dental Clinics, New Delhi. Dr. Avinash Phadke, President, Technical & Mentor, SRL, Diagnostics, Mumbai. Dr. Clive Fernandes, Group Clinical Director, Wockhardt Group of Hospitals, Mumbai. Dr. Sanjay Gupte, Medico-Legal Expert, Pune. The valedictory ceremony will be held on April 20, 2019. Dr. Deelip Mhaisekar, Vice-chancellor, Maharashtra University of Health Sciences will grace the occasion as Guest of Honor. The session will be presided by Dr. S. B. Mujumdar, Chancellor, Symbiosis International (Deemed University). SYMHEALTH 2019 will continue to bet on increasing the presence of organizations, exhibitors and visitors from around the nation to keep on generating synergies, sharing knowledge, provoking discussion, reflection and inspiring new actions. It will eencourage all the stakeholders to expand their knowledge horizon as well as to forge collaborative networks across disciplines and professions. The attendees will benefit enormously from the event.